Should I Get My Ankle Sprain Looked At By A Doctor? Ankle sprains are very common injuries that occur to both athletes playing sports and people simply walking around that injure their ankle after a misstep. Ankle sprains can have varying degrees of severity, from simple sprains that feel better in a few days to more serious sprains that still hurt after a month or more. 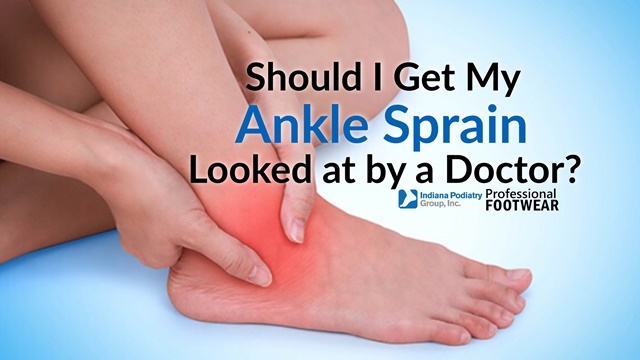 The problem with ankle sprains is that more often than not, the injuries that occur with each sprain can have lasting effects on the stability of the ankle, as well as long term damage that may not be immediately apparent. Most sprains occur when the foot rolls inward at the ankle, stretching the ligaments (stiff straps of connective tissue) that bind the outer side of the ankle joint. There are three ligaments in total on that side, and the severity of the sprain is judged by how many ligaments are sprained, and whether each ligament is simply stretched or if it outright torn. Stretched ligaments heal, but can lead to a future unstable ankle, while torn ligaments nearly always lead to ankle instability and the likelihood of other sprains to come. This also increases the risk for one of these injuries to lead to an ankle fracture. What is often not recognized is that the force that causes the ligaments to stretch or tear also frequently causes other injuries. These can include muscle strains, sprains of smaller joints in the foot, microfractures in bone, nerve injuries, tendon strains, as a well as a number of additional issues that can lead to long term foot and ankle damage. The effects of these additional injuries may not be seen for many years, and are often not associated with the prior sprain because of the time that has passed. Unfortunately, many of these secondary injuries are missed when one goes to the emergency room after an injury, as care for sprains in those facilities in basic and geared towards ensuring there is no fracture. It is generally important that all sprains have medical assessment, but it is equally important this be with a foot and ankle specialist trained to identify all the elements that compose that particular injury. Early intervention with proper ankle stabilization, timely physical therapy (if necessary), as well as careful guided return to full activity can make the difference between a sprain that recovers without future consequence and one that leads to future pain and injury return. It makes no sense to ‘tough it out’ for a month or two prior to getting care, especially when help is so readily available. "Hello, Jesus, Sorry about your ankle. As a general rule, if you are unable to bear weight on the foot, then I would have it looked at by a Podiatrist or Medical doctor. In the meantime, you can apply ice, elevate it to control swelling, and decrease your activity. If not improving steadily, then it needs to be checked. Yesterday I went to the park and when I going to kick the soccer ball ⚽️, a kid quickly stopped the ball and and it was to late for me to avoid kicking the ball so when I kicked it, I fell s the floor in pain because my ankle was hurting. They did not take me to the doctor because it was to late at night and during night time I had a tough time sleeping. I can walk properly with my two legs and I can’t stand in the leg that I injured because I get some bad pain. Is my ankle sprained and should I go to the doctor?